Israel-based artist Berg—a.k.a. Shlomi Berg—has entertained hundreds of thousands of followers around the world. His performances encompass a half-dozen of the world’s most acclaimed—and massive—dance parties, including Brazil’s Tribe Festival and Experience Festival, Mexico’s Equinox Festival, Denmark’s Tam Tam Festival, Israel’s Unity Festival and France’s Inox Festival. 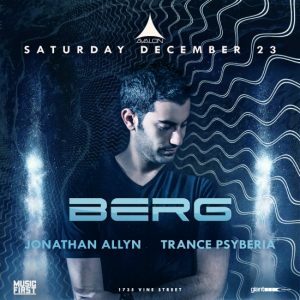 At the age of 25, Berg has already become one of the globe’s leading acts—over the course of just four years, when the sonic mixologist first launched his name brand. His ability to bring a crowd to its feet with hands waving in unison, as well as his mad beats, have fans from nearly every nation in the world pleading for him to make an appearance. Across the time Berg has been consolidating his own style based on the desire to mix different sounds that brought inspiration, being able to take it to a new level which gave him the opportunity to collaborate with different artists such like Neelix, Symphonix, Capital Monkey, just to name few of them, releasing amazing tunes into well known labels like Spin Twist Records, and so Blue Tunes Records, in which he is currently signed up. Berg has released four EPs and the full-length album project “Life Apart,” where we can find some of his worldwide hits like Generic Drugs, Double Edge and his most acclaimed hit by now, Soul Provider.